The E-Basic language provides both a Terminate and Timeout method on InputMask and InputMaskManager objects. This Terminate method causes the input mask(s) object to cease looking for responses. Although it behaves like an input mask timeout, it does not score the parent object like a timeout would. For example, if an experiment had a Keyboard input mask and set the correct response (CRESP) value to empty, a timeout would cause the accuracy (ACC) to equal 1 because RESP=(empty) and CResp=(empty). However, if you called the Terminate method on this input mask, it would abort the mask and not transfer its properties such as RESP, CRESP, and ACC to the parent object. 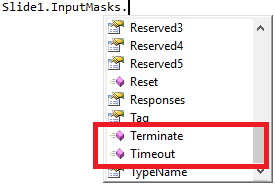 The Timeout method causes the input mask(s) objects to act as if they had timed out regardless of the time limit value - stopping them from further looking for responses and transfers its properties such as RESP, CRESP, and ACC to the parent object. Calling Timeout on an InputMask causes the mask to timeout, even if its time limit has not been reached. The major difference between the Timeout and Terminate methods is that Timeout forces scoring on the parent object, transferring properties such as RESP, CRESP, and ACC. Calling both Terminate and Timeout on an InputMask that is not armed results in a runtime error. WARNING: This feature breaks syntax compatibility with E-Prime 1.0. Using the InputMask.Timeout or InputMaskManager.Timeout methods on an E-Prime 1.0 run-time system will result in a compile error.